You want to start a diet and shed a few pounds, but you decide, since it’s November already, you should just wait until after the holidays. You tell yourself you’ll have a fresh start January 1st. New year, new life, all that. This plan may sound good to you, but since you keep thinking about the diet you’re going to start in January, you indulge more than you normally would over the holidays and gain 10 pounds. Now, you have an even bigger job ahead of you come January 1st. If you had instead started your new eating plan at the beginning of the holiday season, you would have had better control over your eating. You likely wouldn’t have gained weight. If you were doing great and were motivated, you may have even lost weight, but let’s be honest—even remaining the same weight during the holidays is an accomplishment. We’re in November, which is when most people are at risk of two negatives—eating too much and spending too much. Just like the decision to lose weight, many people may decide to start focusing on managing their money better after the holidays. After all, there are so many presents to buy and parties to host. Getting on a budget isn’t possible during the holidays, they think. And then, because they’re not keeping an eye on their finances, they spend lavishly and find themselves facing an exorbitant credit card bill that they can’t pay in full. Why not make this year different? Don’t give gifts to everyone. If you don’t have a lot of money saved up for gifts, don’t go into debt to buy them. Think about it. Do you remember what gifts you received for Christmas last year? Do you remember who gave them to you? I remember only one gift from last Christmas, even though I got several. Give a gift that you can pay for later. I love this strategy! If you don’t have a lot of money for holiday gifts but still want to give something, consider offering a gift at a later date. For instance, you could offer a close friend a present of dinner and a movie at a time of her choosing. Maybe she decides in March that she’d like to take you up on the offer. You’ve had three months to save the money for that gift. Don’t give in to peer pressure. There is an enormous amount of peer pressure during the holiday season to go to parties, bring food, buy gifts for everyone. . .It’s okay to step off this spendthrift merry-go-round and simply say no. You don’t have to go to every party. You don’t have to buy a present for everyone you have contact with in your life. The next four to six weeks can have a significant impact on the first few months of 2016. Are you going to indulge occasionally in sweet treats but mostly eat healthy, or are you going to let loose and gain 10 pounds? Are you going to be financially responsible and only give gifts that you have the means to give, or are you going to charge everything and create a hole that will take you three or four months to dig out of, if not more? 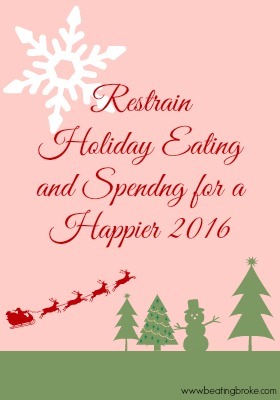 Haven’t you had enough of overindulgent holidays? Wouldn’t you like to start 2016 with a truly fresh start and no extra weight or bills? I’m not a big shopper. Never have been, never will be. However, I do love scoring a great bargain, which is why I do some shopping on Black Friday. However, I always remind myself that even the best deal isn’t a deal if I’m buying something I don’t need. If you want to snag some great Black Friday deals, but you want to be mindful of your money (and your spending), trying using these strategies. Notice I didn’t say, make a list of what you “want.” There are lots of things you might want looking through the Black Friday ads. You might want the electric blanket that will keep you toasty all night long, but do you really need it? Your son might want the latest gizmo toy, but does he already have so many toys that he doesn’t have room to put them all away? Move on. Make a list of things that you truly need. Last year, my husband and I noticed that our kitchen pots and pans were getting scraped up at the bottom and the non-stick coating was coming off. We bought a set from Kohl’s on Black Friday, and after the sale and rebate, we got the pans for less than 50% of the retail price. I was also tempted by the deal on a Kitchen Aid mixer, but I didn’t need the Kitchen Aid mixer, I just wanted it, so I passed that deal up. Many people think of toys and electronics when they think of Black Friday deals, but expand your horizons. If you need new towels because yours are ragged, Black Friday is the perfect time to look. Look around your house at anything you think you may need to replace in the next year and consider taking advantage of the Black Friday sales. Thanks to the Internet, there’s no need to go shopping on Thanksgiving to score the deals or to fight with the hordes of people flocking to the store. Most of the time, the stores only stock a limited supply of an item that will likely be sold out before you get to the right aisle. Shop online from the comfort of your home, and you’ll find almost everything you want in stock. Better yet, many retailers offer free shipping, so it can be delivered right to your door. If you’re shopping online, make sure to take advantage of additional savings. Use a site like Ebates to get cash back for some of your purchases. You can also shop online codes to get free shipping if the store doesn’t already offer it. Now that Black Friday sales are so popular, retails are trying to extend the Black Friday shopping season. First, they began opening their stores late on Thanksgiving night. Last year, many retailers offered their Black Friday sales online during the entire week of Thanksgiving. I think we scored our pots and pan deal on Monday, four days before Black Friday. Find a deal blogger to follow, if you don’t already, to get the latest scoop on when the sales will start. Use these tips to score the best Black Friday deals, keep your budget intact, and enjoy your time with family on Thanksgiving. 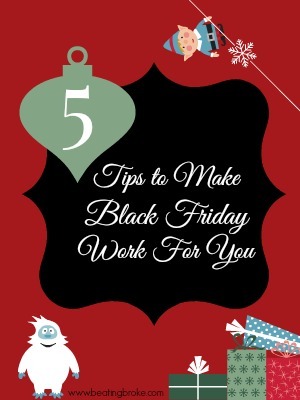 Do you shop on Black Friday? What other tips would you add to this list? The holiday season will soon be upon us. If you find yourself stressed out every holiday season by financial and time demands, now is the time to decide that this year will be different. Now is the time to decide on a giving holiday. Not only will you benefit, but your kids will as well. Last time we talked about teaching your kids to give during the holidays, and this time we’ll talk about the second part of creating a giving approach to the holidays–teaching your child to have reasonable expectations for presents. Years back, the holidays weren’t simply a time to get-get-get. As a girl, I loved reading Little House on the Prairie, and I was always amazed by how delighted Laura was by the simple presents she received. One year it was a tin cup and an orange. Another year it was a corn cob doll. Now, our kids receive oodles of presents and still demand more and are disappointed when the present opening is over. If you’re the parent of older children and you previously gave them too many presents, you might sit down with them well before the holidays and let them know that they won’t be getting as much this year. You can explain that you want to focus more on giving rather than receiving. Plan on some resistance, but if you hold firm and continue to treat holidays this way, your kids will adapt. If you’re children are younger, you can start the tradition of a simpler Christmas now. Your kids may express some resentment as they age and see how much their peers are getting, but if it’s your family tradition, they will likely understand. You and your significant other will need to decide what works best for your family. Some families decide on a dollar limit per child and don’t go over that amount. This is the way that my mom always handled Christmas for my brother and I, but she carried it a step further and made sure that we each got an equal number of gifts, too. Other families say that Jesus received 3 gifts from the Wise Men, so they give their kids 3 gifts for Christmas. Another take on this is to give your child 3 specific presents–something they want, something they need, and something they’ll wear. In our family, we are blessed with grandparents and godparents that give our children many presents. So, we buy our children very little for Christmas. The one time we did buy our kids a lot of Christmas presents, they simply received too much. Finally, some families take an extreme approach and don’t exchange presents at all. Instead, they donate all the money they would have spent to charity. If your children are already used to lavish holiday celebrations, scaling back may be difficult, but it’s not impossible. First teaching children to be givers and then scaling back may help ease the transition for your child. How do you determine how many presents to buy your child? Do you worry about going overboard with gift giving?